Colorful, vibrant hairstyles are definitely in fashion at the moment. It’s a trend that doesn’t seem to be going anywhere anytime soon. Whether you want a fresh look, or you’re ready to unleash more of your wild personality, switching up your hair color is a great way to do it. Unfortunately, stripping your natural hair color away with bleach can damage your hair and scalp. 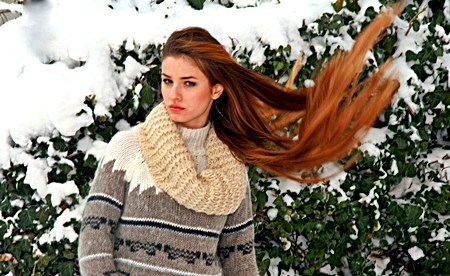 So, is it possible to get vibrant hair without bleaching it first? The answer is yes. Bleach and permanent dyes can strip your hair of moisture, down to the scalp. That can create a long list of problems, including a loss of gloss and shine. Not only will your hair look dull and dry, but it could be harmful to your scalp. If you’re ready to experiment with hair color or want to change your hair color from dark to light brown, try to avoid using bleach. If you want to go the traditional dyeing route, go to a salon. They are more equipped to use the right methods of safely stripping away a darker color and adding something more vibrant. However, even a professional salon can end up damaging your hair and scalp with certain chemicals. Thankfully, there are several alternatives to consider if you want colorful hair. Our top picks are the SOOKOO 6 Color Hair Chalk Set and the Rosenice Hair Chalk Comb. It doesn’t matter if your hair is naturally dark or light, you can achieve the vibrant look you want. Best of all? It can be done safely, without damaging your hair or scalp. Does Bleach Damage the Scalp? How Can I Protect My Hair & Scalp? Can I Have Colorful Hair without Causing Damage? This article will focus on a few safe alternatives to dyeing your hair using bleach. We will also cover some of the risks you may be under when you do use bleach on your hair. Using harmful chemicals can do worse than strip away color. Unfortunately, many people don’t realize that until they have already damaged their scalp. Knowing exactly what bleach can do will likely make you want to keep it as far away from your hair as possible. Let’s take a look at some of the harmful side effects it can cause. When you use bleach or a product that contains it on your scalp, it can cause more damage than you may think. Bleach can not only strip your hair and scalp of its colors, but of essential nutrients and oils. Any bleaching process can damage the hair. However, the more often you do it, the more damaged your hair and scalp are likely to become. You may even find that it hurts to touch the scalp or brush the hair. Often, bleaching agents will have coloring added to them. Because of this, it’s always a good idea to do some allergy test before going through treatment. Some stylists will call this a patch test. If you experience an allergic reaction or have sensitive skin, it’s not recommended that you go through with the bleaching process. Bleach can burn your scalp. If you experience that burning sensation at any point during a patch test, tell your stylist immediately. If you’re bleaching your hair at home, rinse away the product and don’t continue to use it. If you already have bleached hair, or you still plan to strip it, it’s important to protect your locks. A good rule of thumb is to apply a deep conditioning treatment about three days before the bleaching process. From there, you should deep condition once a week after the hair has been stripped. Bleaching can cause your cuticles to tangle, which may give the appearance of dry, frizzy hair. Use a strong conditioner daily to lock in moisture and reduce the risk of knotting. Finally, be aware that bleached hair is vulnerable hair. It soaks in moisture like a sponge but can lose it just as quickly. This causes it to become dry and brittle. Protect it from heat and regular daily styling tools. Avoid taking hot showers, and use a heat-protectant spray that will add moisture. Hair gel/chalk: These have become increasingly popular, due to how easy they are to use. For chalk, you simply add water and place it wherever you want color on your hair. With gel, you apply it to dry hair and comb it through to your desired style. Many of the top brands in hair color have recently introduced these products. They wash out right away and add a bit of funky vibrancy to any natural hair color. Take a closer look at the SOOKOO 6 Color Hair Chalk Set. Chalk combs provide an easy way to add temporary color to your hair. One of the best options is the Rosenice Hair Chalk Comb. You’ll be able to choose from up to 6 bright colors. They can be used individually or combined for maximum effect. The ingredients are non-allergenic and FDA approved. Cream eyeshadow: If you already use a cream for your eyes, you can double up its value by using it on your hair. Vibrant, rich colors of cream shadow work very well on even the darkest hair. Simply use the shadow straight from the pot, applying it wherever needed. It washes out with shampoo and is so easy to use you can even apply multiple colors for a unique look. Hairspray: Vibrant-colored hairsprays, such as Rubie’s Bright Color Hairspray, have been around for a while. But, they are very effective. Be sure to look for sprays without harsh chemicals or peroxide. Applying is as simple as spraying the color wherever you’d like it. You can purchase sprays in a wide variety of different colors, and they will rinse away after just one wash.
You don’t have to use bleach to get vibrant hair color. While these solutions may not be permanent, they are just as fun. What’s the best part? You can choose different colors all the time, without doing damage to your hair or scalp. These alternatives are also fairly inexpensive. So, you can add more color more often, without harmful side effects. People tend to use bleach before coloring their hair, so they have a ‘blank canvas.’ If you have dark hair, lightening it is necessary for bright colors to show up. But, bleaching isn’t the only option. In fact, you can lighten your hair safely using products you may already have at home. Let’s look at a few natural, DIY alternatives you can use to lighten your hair before coloring. Lemon juice: If your hair hasn’t been color-treated, lemon juice is a popular lightening method. You can apply it all over your hair, or give yourself lighter ‘highlights.’ Fresh-squeezed lemon juice is more potent than bottled. To use, mix equal parts lemon juice and water in a spray bottle. Spray all over your hair. Go outside and sit in the sun for 30-60 minutes. It’s the UV rays of the sun that activate the lemon juice’s lightening power. Chamomile tea: This works best on hair that is already fairly light, but needs to get brighter for coloring. Steep five tea bags in hot water and let sit until cool, about 30 minutes. Add the tea to a spray bottle, reserving a few tablespoons. Spray all over your hair evenly, and allow to dry. Add the reserved tea to your regular conditioner. Use it the next time you take a shower, letting it sit for several minutes before rinsing away. Honey: It can both lighten your hair and add moisture. It contains a small amount of hydrogen peroxide, which helps the lightening process. The easiest way to use it is to add two tablespoons to your regular conditioner. Use the conditioner as you normally would in the shower, waiting several minutes before rinsing. While these ‘home remedies’ may not work as quickly as bleach, they are safe alternatives that won’t strip away essential nutrients from your hair or scalp. Again, vibrant hair colors are in style. Whether you want to achieve a lasting look, or need something funky and fresh for a party, there is no ‘wrong’ reason to want to color your hair. But, it’s important to do it safely. You don’t want a cool, vibrant color to do lasting damage to your hair or scalp. If damage has been done, here are some good shampoos for split ends and dry shampoos for colored hair. As you can see, though, there are alternatives. You can use items in your own home to lighten your hair before coloring. Or, you can use temporary colors. There are multiple ways to achieve the vibrant look you desire without doing damage. There are also ways to straighten your hair without chemicals that you may wish to use. If you are still interested in permanent hair color, talk to your stylist. Make sure you’re on the same page about the safety of your hair and scalp. It should be the top priority for you and your stylist before coloring your hair. If your scalp has become overly dry, you can make life more comfortable.